This post may be controversial to you. It may challenge your beliefs, ruffle your feathers, or it may cause some of you say, "you're preachin' to the choir!" Good teaching is hard work. Just "being" a teacher in the room... well, it can be easy. Keeping students "comfortable," not confronting them with or coaching them to high standards, blaming students... all of those things are easier than the really tough job of good teachers. 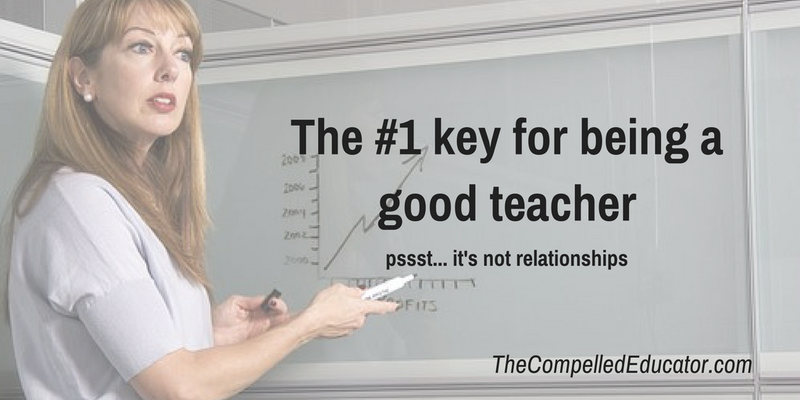 I am going to share what I believe is the #1 requirement for a teacher to be good, successful, and happy in the classroom. Even before building relationships, it takes a positive mindset from the teacher. The teacher must 1) believe in him- or her- self, that he or she can build a positive relationship with student and make a difference, and 2) love ALL kids. In what feels like long ago, I attend a wonderful PLC conference where I got to hear from Rick and Becky DuFour and others. I will always remember the four kinds of schools that Rick named and described. Henry Higgins was the professor in My Fair Lady who turned Eliza Doolittle, a Cockney working-class girl, into someone who can pass for a cultured member of high society. At the PLC conference, Rick DuFour reminded us that Henry Higgins had more confidence in his own abilities than in Eliza, which was how he was able to relentlessly help her to rise to his expectations. Teachers must believe that they can and will make a difference. Teachers must have confidence in their abilities to help students meet their expectations. They must also have confidence in their abilities to adapt, build relationships, use the tools in their toolbox, and lean on others when they need help. This is not easy. This takes a certain mindset. Part of this positive mindset is a love for students. Really think about this sentence. Don't gloss over it like a prospective teacher in an interview for his or her first job.... "I want to be a teacher because I love kids." Do you love the kids who dress in all black and wear fingerless gloves every day? Do you love the kids who don't sit down when you tell them to? Do you love the kids who roll their eyes when you tell them it's time to get to work on their assignment? Do you love the kids who don't say hello back to you when you say hello to them? Even before trying to build relationships, a good teacher loves ALL kids. see if they can find out what it takes for you to give up on them. We know this about kids. And when we love them we accept that this is part of who they are. When we LOVE others, we make a commitment to them. We make a commitment to listen, forgive, care, and accept. It takes this kind of mindset PRIOR to trying to build relationships. It takes a recognition of where kids are developmentally, accepting each and every one where they are on their journey, and doing everything you can to help them to be successful. What do you think? Is a positive mindset the #1 requirement of being a good teacher? Please leave a comment below or connect with me on twitter. I completely agree, teacher mindset is the starting block. A highly knowledgeable &/or experienced instructor won’t be as effective with today’s student as a teacher who begins by caring about & believing in their students. If you don’t care, they don’t care. It seems self-destructive but it’s reality. If they witness that you love them unconditionally, they’ll do anything for you. It may still be accompanied by an eye-roll, but they do it. Teens can smell a phony - you have to actually love them, individually, not just the ones “playing school” well, all of them. Yes! Yes! A thousand times over YES! You must love ALL kids, no matter their dispositions, and be confident in your ability to make a difference in their lives. Such a powerful post, Jennifer! This is the spark that lights the fire and keeps it going through the challenging times. Love wins every time! This is good Jennifer! We have to live in the reality of knowing that we will have some students who are difficult to educate and difficult to connect with. However, we have to have a positive mindset and believe that all students can learn and believe that we are the person who can reach and teach them. I love all kids. I agree we have to look beyond what a student gives us to see their capability! I challenge myself to do this everyday! A student is not their behavior. Thanks for the reminder!